Caulk usage during toilet installations is somewhat of a hot issue among plumbers. Some argue that the seal it forms with the tiled floor is very strong, to the extent that when removing the toilet due to maintenance purposes, it will come off with some of the tiles. Others prefer using caulk because it gives a good finish while also preventing water seepage under these tiny crevices left between the toilet and the tiles. Sealing this joint also means that tiny animals such as cockroaches cannot build their homes in these tiny spaces. Despite these arguments, it is clear that caulk has some very good benefits. These article lists 5 of the best toilet caulks, with a view of helping you find the ideal one for your toilet. 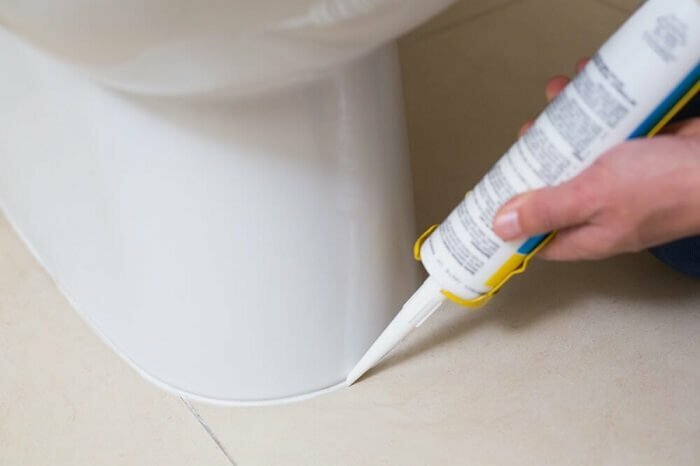 Sashco’s Big Stretch caulk is a very affordable product that comes in a 10.5-ounce bottle, which is more than enough to seal the toilet to the floor as well as cover up some cracks in the bathroom. If your bathroom has a colored finish, the caulk color should not worry you. The product is available in 12 different colors plus a 13th clear coat. The colors include white, tan, grey, almond and wood tone among many others and from this wide array, you will certainly find a color that matches your bathroom’s décor. Additionally, the caulk is paintable and thus, if you don’t find a suitable match, you can apply a tiny layer of paint so that it blends in. A huge advantage that this caulk has is that it stretches even when cured. This is a big thing because toilets can rock around a bit and with a very rigid caulk or sealant, cracks may as a result of this movement. However, with the Big Stretch, cracks will not appear at all even with temperature changes and this makes it very durable. When it comes to maintenance, once the caulk dries up, it can be easily wiped or washed using water, just as you clean up the rest of the bathroom. This is quite convenient because it does not require special care. Applicable in interior and exterior use. The Gorilla Silicone sealant is the most affordable caulk in this review. However, this does not mean that it is a low-quality product. For starters, it is a fast drying sealant that can be ready to wipe or wash using water in as little as 30 minutes after application. On top of this, the sealant forms a waterproof seal and this helps to maintain its durability because external factors such as water cannot affect the integrity of the bond that it forms between the two surfaces. Having silicone as its main ingredient makes it suitable for both indoor and outdoor use. Silicone is very much like rubber and thus, its usage outdoors will ensure you get a completely waterproof joint. In terms of color, this sealant is only available in white and a translucent clear color, and both do not yellow over time. Additionally, it is resistant to the growth of mold and mildew, which means that they will also not change to a different color as a result of this growth. Instead, it retains the clear color without shrinking or cracking. While it is affordable, it comes in a 10-ounce cartridge, which is not as much as the Xtreme Bond’s product above, but it is sufficient for fitting at least one toilet. Fast drying action. Can be washed in as little as 30 minutes. Forms a durable, waterproof seal. Available only in white and a translucent clear color. Does not yellow over time. If you don’t mind spending a little bit extra on caulk, this is a good product to consider. 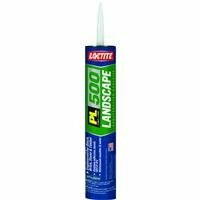 This PL500 comes as a 12 pack, which explains its high price, and this gives you a whole lot of adhesive to work with. It is available in either 10-ounce or 28-ounce cartridges, meaning that at a minimum, you can get a total of 120 ounces or 336 ounces in total. However, this being the 28-ounce cartridge PL500, you will have 336 ounces at your disposal. A single pack is also available, just in case you want a small quantity. 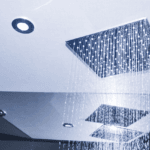 The product’s formulation makes it usable on a variety of different moisture and temperature conditions, ranging from sub-freezing to warm temperatures (0 – 100 degree F) on wet or dry surfaces. This makes it a very versatile and practical adhesive because such conditions usually vary from one toilet installation to another. 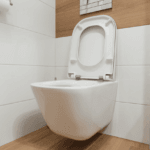 Once applied, the PL500 forms an elastic joint that keeps the seal tight even as the attached surfaces, in this case, the toilet base and tiled floor, expand at different rates or move around a bit. Comes as a 12 pack, but is also available in a single cartridge. Forms an elastic joint between the attached surfaces. Can be used on different moisture and temperature conditions. This is also an expensive product but it comes as a full kit containing resins, adhesives, mixing sticks, gloves and injection nozzles among many others. With such a kit, you can begin installation straight out of the box, and this gives you value for your money. The product is actually meant for filling cracks and preventing leaks in wet or dry concrete and thus, it can be used to fill the gap between the toilet and the tiles in either wet or dry conditions. A big advantage that this caulk has is that it quickly expands after application. This means that you can apply it using a low-pressure injection gun and once it penetrates the gaps, it expands to form tight seals that are waterproof yet flexible enough to accommodate some movement. However, as much as it does form these reliable seams, this caulk does have its limits. It can only be used on 1/16 – 1/2 inch gaps and thus, any gap that is out of this range should not be sealed using this product. Comes as a full kit containing resins, adhesives, gloves etc. Quite expensive but the full kit package makes it worth the money. Forms very tight waterproof, yet elastic seals. Ideal for cracks that are 1/16 to 1/2 inches wide. Xtreme Bond’s caulk is a top rated adhesive and this is primarily due to its super sticky characteristic, which makes it feel like liquid nails on steroids. 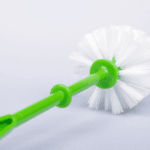 The product actually forms a bond that is 3 times stronger than regular adhesives, which for your toilet means that it will sort of be permanently fixed on the floor. Additionally, it can still work on wet or frozen surfaces and has a fast drying, quick adhesion action across all temperature conditions. Even though removing a toilet from the floor after using Xtreme Bond’s product might be difficult, such a seal will reduce the rocking movements by making the toilet sit stably on the floor. 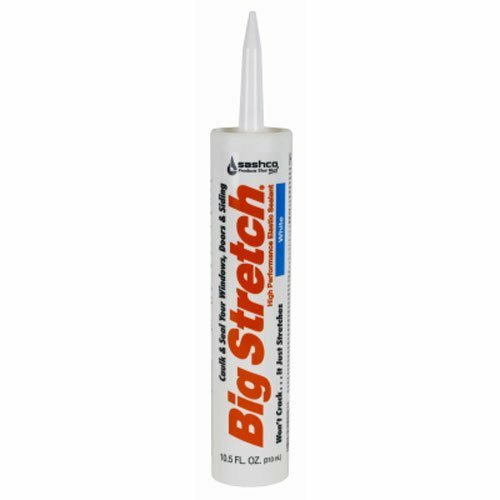 When it comes to quantities, this adhesive comes as a set of three 29-ounce cartridges, which total to 87 ounces. Though a bit expensive, this quantity is more than enough to finish off on a couple of toilets and still have a lot more left for sealing other joints. When properly stored, it has a shelf life of about 1 year, which gives you enough time to use the remaining product before it becomes useless. Forms a bond that is 3 times stronger. Low odor and low VOC formulation. Comes as a set of three 29 ounce cartridges. Versatility in these products is mainly considered regarding use. A good toilet caulk should be ideal for indoor use, with features such as low VOC (Volcanic Organic Compounds) because this makes it safe to use. However, the best toilet caulk should be ideal for both indoor and outdoor use by having both a low VOC and waterproof as well as weather resistant properties. Such an adhesive would be versatile enough for filling up every crack that you see inside or outside your house if some of it is left over after caulking the toilet. Cost is a very critical factor that should be considered before buying anything. When shopping for a toilet caulk, a comparison should be done based on the quantities and cost. Some adhesives are very affordable but come in small sized cartridges that can only be used to caulk a few toilets. There are others that come in multiple packs, which are ideal for large caulking projects but are quite expensive. Well, there are two ways of looking at this. If you are working on a small caulking project, buy a small quantity. Never buy a lot just because the price per unit is cheaper. The adhesives might expire after their short 1 year or so lifespan, and this will be a big waste. If you are working on a big caulking project, buying in packs is always cheaper but it is vital that you compare the cumulative quantity of the pack vs. the price. 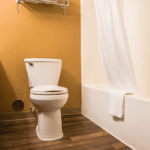 It is important to consider the color of a toilet caulk because of your bathroom’s interior décor. White is a very common color but your bathroom might have a grey or even a wood tone finish. As such, you need to get the appropriately colored caulk so that it blends well and forms a good finish. Alternatively, you can buy a caulk that is paintable so that you can layer a matching color with your décor. However, this is not a very good idea because first, you will be required to buy paint and second, painting down there is not very easy. You will bend a lot. 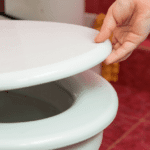 Though a toilet is fixed on the floor using bolts and nuts, it is common for it to shake a little. If you intend to caulk it so as to prevent seepage of water into those gaps, a rigid adhesive will not work. The tiny movements the toilet makes will eventually cause the caulk to crack or stick to one surface only. However, an elastic caulk will be able to stretch as the toilet rocks and thus, maintain the integrity of the seal. Buying is one thing and installing is another. If the caulk requires thorough preparation such as wiping the surface completely dry, the installation process will be a hard task. However, if the caulk can be applied on wet or dry surfaces, pre-installation preparations are drastically reduced, making it very easy to install. Such a product is the best to buy because it is very easy to use. If you get a kit with essential accessories such as gloves, well and good. However, the cost factor also kicks in here. 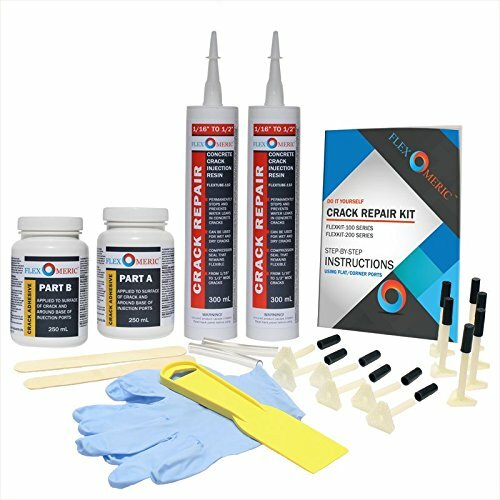 If the accessory makes the caulk kit very expensive, it might be worth considering if buying the accessories separately is cheaper so as to get the best deal. As you can see, there is a lot about this product that you probably didn’t know about. They may be just simple adhesives to you but if you want a good looking finish on your toilet, it is important to get the best toilet caulk. After going through this article, you should be able to pick the best product from the 5 listed ones so as to seal that gap that you can’t help but notice every time you go into the bathroom.